Developer Quote: "It's your job to drag them [the letters] back up to their correct positions and figure out what that quotation is." Keep the brain moving and the thoughts flowing! There's no better way to do this than to solve intricate puzzles of all genres. Sometimes a challenging puzzle can take your mind off your problems while putting a smile on your face and growing those old brain cells simultaneously. Many folks will enjoy Topple! because it contains 2 excellent sources of fun (quotations and puzzles) in one app. In this intriguing word game, puzzle app, you will solve the mystery by falling back on your knowledge of popular quotations, then dragging the letters to the right spot to display those words. The letters of the quotes have been randomly scrambled (much to your dismay and delight)! You are allowed to drag tiles up and down, or tap on an unplaced tile to make it shift to the highest unfilled location. This absorbing game now has 288 puzzles to enjoy. The quotes are not so difficult to solve, and do not require you to overexert your mind! What's more, you get to select more In-App Purchase puzzle packs with quotations of renowned writers such as Oscar Wild, Ghandi, Shakespeare, Twain and more. Puzzle lovers, put away your old pencils and papers, and start filling in the quotation blanks on your iDevice with Topple!! 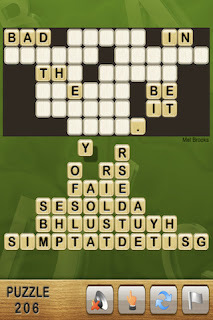 COOL CONCLUSION: "Enjoy both well-known quotations and puzzle solving in the relaxing yet addicting word game, Topple!" --iOS/Age Rating: This app requires iOS 3.0 or later. iOS 4.0 Tested. Rated 4+.